Oh, if I could only wrap myself in the word of God and make it my blanket, my head would snuggle in its phrases and my heart would feel its warmth in delight. If within its pages I could lose myself and never return, I would ask God for others to do the same, and swim in the ocean of its truth to experience the breadth of God’s love. Oh, how wonderful God is to have opened salvation to us through Jesus, the author and finisher of our faith. For only through Jesus, the Word, can we attain salvation (John 1:1-4, 14). Line upon line, verse upon verse; every word from God’s mouth is a light on to my feet. It builds. It edifies. It supports the church on a cornerstone others have rejected. And it floods the spirit of those wanting to know what truth is. Be enraptured by God’s word. Be enthralled by it. Grow in its knowledge and in its depth. Know that he gave us this moment in time to draw nearer to him in absolute adoration and joy for him. For the joy of reading God’s word is life on to the reader. Let us read life into our lives. If we pray steadfastly, God will never abandon us. He will never leave us. He will always be there for us, as He had done by giving His son Jesus as a sacrifice for our sins. God would do anything to give us everything under the sun. Let us bend our knees to our Father, for He is a gracious God, the only god, who leads us, protects us, loves us for the sum of who we are, and does not judge us as others would judge us. Let us close our eyes and in deep humility let us worship Him for everything He has done for us in our lives. His spirit holds everything together. We may weep; we may wail; but in all things, God hears us and values our prayers as unmeasured treasure. Our voices are like gifts to Him. Let us give Him the gift of praise. Pray always and never give evil a chance to sprout. God is a generous god, the only god, the One who will always give to those in need. Love does not hate; it does not boast, nor does it seek revenge. Love cares for another more than oneself; it is not proud, arrogant or unmerciful. Love leads, conquers prejudice, and gives even when in need. Love is not afraid and will always be kind. Jesus demonstrated that very love when he died on the cross for us in order to pay for the penalty of our sins. And although the night before his death Jesus fervently prayed to God regarding this great responsibility placed on his shoulders, he still accepted it because it was God’s will. No other act in human history depicts just how much God loves us than for him to have given his son Jesus as a sacrifice to redeem us from death. What is love? It is to look upon Christ’s sacrifice and to conclude how selfless an act it truly was for him to give his last breath for us sinners. It is to become like Jesus and to sacrifice ourselves for others as a means to allow Christ to live in us, not only in word but also in deed. We Christians owe our lives to God, and what better way to show our love for him than to give as he gave so that we can experience the fullness of his love living in us. No greater love is it than to sacrifice one’s life for friends. As we move into the new year, let us resolve to let our light shine so that others may see our good works and give glory to our Father who is in heaven. If we Christians cannot attain perfection without divine intervention, how is it that Jesus encourages us to be perfect? How can we become like God when our sins keep us separated from the one being who embodies love? Of course, there is a fallacy to this argument. The mistake lies in the belief that our sins separate us from God. In reality, Jesus paid for all our sins with his shed blood, and we can now approach God’s throne clean and unblemished (2 Peter 1:9). Every time we ask God for forgiveness, we become new again. 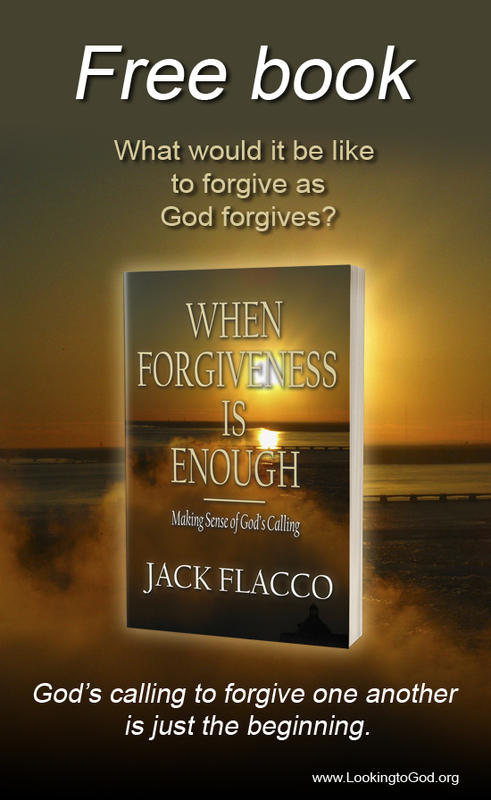 Every time God forgives us, we no longer need to harbor the guilt of our sins. We become unbroken and live again. That is God’s gift to us for believing Jesus is his son. His grace sets us free from the penalty of sin, which is death (Romans 5:15). The joy of the gospel is not that we are free to do whatever we want, because that would be selfish on the part of every Christian, but that Jesus conquered death by rising from the grave to sit at the right hand of the Father (Acts 2:32-33). The good news is the elect have hope in Jesus with the promise of eternal life. That promise goes beyond this tiny speck of a life we are now living, and transcends into eternity (Psalms 8:3-5). Therefore if some come to you and say, “Jesus is over here!” and then you see the object of their affection is this world and everything in it, do not believe them. Material wealth perishes, as does the recognition of others (Romans 8:6). And if some say to you, “Jesus is over there!” and you find they are looking to themselves for approval, do not believe them. None can buy their way into the kingdom, for the kingdom of heaven is God’s gift to those who believe (Romans 6:23). Instead, pray every day for the kingdom to come and for God’s will to be done. Bless those who curse you. Give to those who beg, and strive to be perfect as your heavenly Father is perfect.